Let's say you have photos from a recent event, your work has been featured in a local paper, or you have a major update that you can't keep to yourself! These are all great opportunities to engage your donors, and potential donors, with your awesome story. Here's a pro tip: Instead of sending out an email or posting the photo on your social media page with the photos or link - post the news as an update to your campaign page. Here's how! Then, share the link to the ioby update via your communication channels. Link donors directly to your Updates feature for the news! As a bonus, this sharing strategy will create additional traffic to your current fundraising campaign. This way, as your network reads your story, they will have the chance to be a part of it by making their tax deductible gift right there on your ioby campaign page! 1. 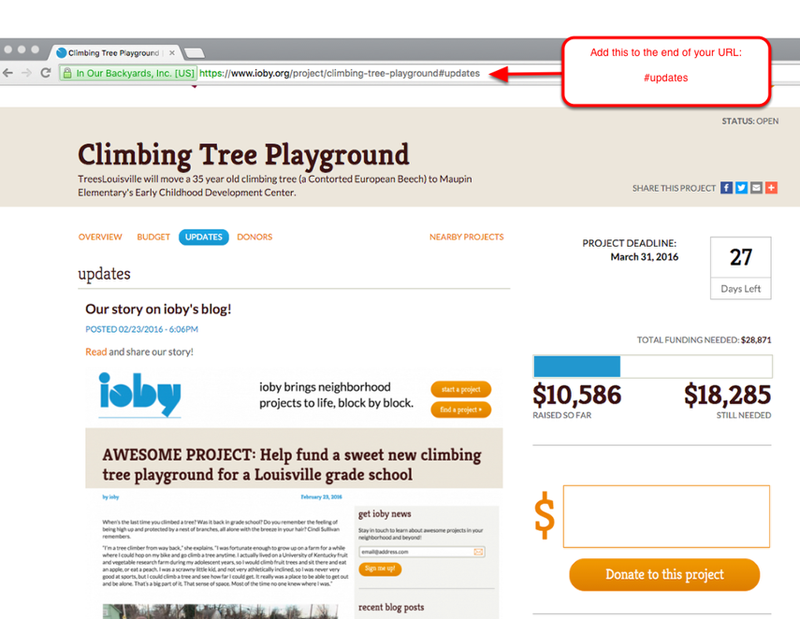 Share updates with your current donors (access your donor list detail to grab email addresses). Thank them for their gift and ask them to share with a few friends. Make it even easier and include some suggested text for them to just copy and paste a message to their friends. 2. Post the link above to your social media sites. You can shorten the URL if it's too long for the social media platforms you use. 3. Share the link with your fundraising team and ask them to follow up with their contacts. At any point in your campaign it is a good practice to cross check your team's current donors with your original prospect chart (potential donor worksheet) and your photos and stories are a great excuse for follow up outreach. Who doesn't love a great story! 4. If you're trying to grow relationships in your community, use this story to spread the word to your local partners about the neighborhood scale project you're leading. Even if they don't give to this campaign you're setting the stage for future collaboration. For all of these sharing steps, don't lose the chance for a wider audience to see your current fundraising campaign. Be sure to use the direct link to your ioby campaign Updates Page.